The Volcano Route (in Spanish Ruta de los Volcanes) is an ancient road of peasants and merchants, considered today as one of the most spectacular hiking routes of La Palma (Canary Islands), where you can enjoy volcanic landscapes and being able to see the two slopes of the island. Since it is not a circular route and there is no bus service in the Refugio de El Pilar area (which is where the trail starts), you will need taxi support. Reserve the taxi before starting the walk. Drive first thing in the morning from your accommodation to the end point of the route, either in Los Canarios or Faro de Fuencaliente, and park your car in the place that we will indicate you when you process your taxi reservation. 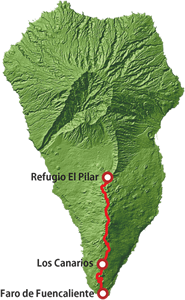 From there, the taxi will take you to the Refugio de El Pilar to start the walk. In this way, you will end the day at the point where you parked your car (recommended option since you can book the taxi for any time in the morning). Request a taxi after finishing the walk. Drive to Refugio de El Pilar and park your car there to start the route. In this case, when you are finishing the walk, we recommend you calling us as soon as you spot the urban area of Los Canarios, and we will indicate the meeting point where you can have a drink before our taxi take you to your car (in this case we cannot guarantee the reservation time since it is impossible to know the exact time at which you would end the walk). We recommend booking a taxi in advance (at least one day before) through our Reservation Form. You can also call us at any of the following numbers: +34 639 357 989, +34 685 791 647 or +34 686 553 868. The route starts from Refugio de El Pilar (1,440 meters above sea level), to climb almost 2,000 meters in the area of Las Deseadas, which is the highest point of the route. From there, it begins the descent to Los Canarios (Fuencaliente) where, on clear days, you can see our three neighboring islands (Tenerife, La Gomera and El Hierro). Once you get to Fuencaliente, you will have walked 18 km for approximately 6 hours. 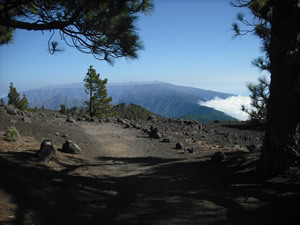 At this point, you have the option to finish your route in the neighborhood of Los Canarios or you can continue to Faro de Fuencaliente, adding another 7 km of walking, in which you can visit the San Antonio volcano (1,677) and the Teneguia Volcano ( 1971) and enjoy the landscape of one of the most important wine areas of the island. At the end point of the route, you will visit the lighthouse and salt pans of Fuencaliente. Consult the weather information and the situation of the footpaths on the official website of Senderos de La Palma before making the trek. It is important to wear comfortable clothes and mountain shoes. On cold days, it is essential to wear protective clothing against wind, cold and rain. On hot days, we recommend wearing a cap and sun protection. Bring enough liquid (minimum 1.5 liters per person) and something to eat.